Magical is hardly a strong enough word to describe the line of cruelty-free cosmetics from Doe Deere. “Unicorns”, is the word Doe Deere uses to describe her clients. 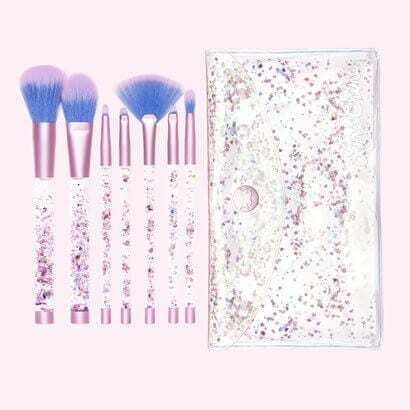 “[A Unicorn] is brave, loves the colour, defies expectations.” Doe Deeres unicorn collection is exactly who she had in mind when she went to the lab, took the shine of the sun and pulled the colour from a rainbow, and created the Unicorn Queen cruelty-free collection. 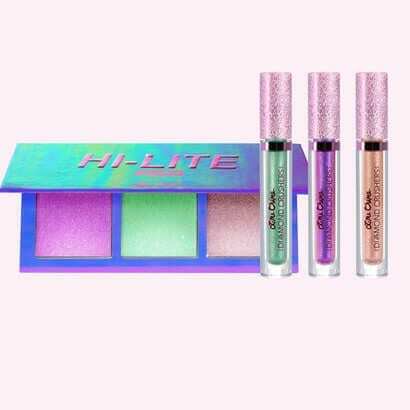 Take a trip to the Lime Crime website and see what this artistic wonder has in store for you, with a colour shine that is beyond description. With Unicorn Queen, you can literally brush the stars onto your lips in hues and shades one would never see at a local beauty supply store. Start with your favourite lush matte lipstick in any colour you desire. Purple, turquoise, pink, violet, even alien green. These Lime Crime mattes are all touch-proof, kiss proof, long lasting, smudge proof, and vegan/cruelty-free. Next, grab one of the smooth, metallic sparkles of one of the Lime Crime Diamond Crushers and your lips will glow with fairy magic. Diamond Crushers can also be used on your bare lips, on your cheeks, and even to sparkle up your eyebrows or even in your bangs. There is no one right way to use Doe Deeres unicorn collection. Aside from the colours, the smudge-free guarantee, the cruelty-free guarantee, plus the fact they are vegan, these products smell amazing. 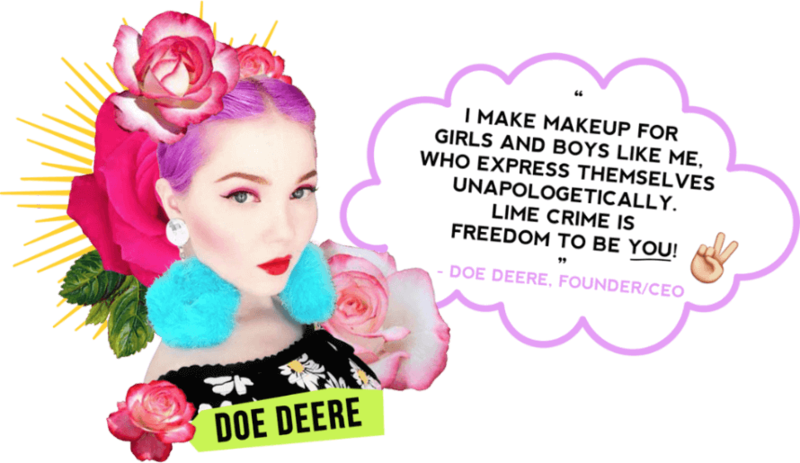 Doe Deere, the mastermind behind Lime Crime, was born in Russia and raised both there and in America. Doe is a firm believer that makeup and colour aren’t about what looks right but FEELS right. It’s not about natural if you feel you’re supernatural. It is not only fine to be different, but it’s also magical to be different, and Doe felt there needed to be a line of makeup to express on the outside, how she and a myriad of others feel on the inside. Lime Crime was born through the desire to give those kinds of colours to the world since the uninhibited colour was lacking in the industry. Animals are close to Doe’s heart, as she has rescues of her own. Bide-A-Wee is a no-kill animal shelter in New York that is a favourite of Doe when she makes a charitable donation. That is why Doe created her cosmetics to be vegan, and completely animal cruelty-free. To Doe, ideas are like children. You must nurture them and help them grow. 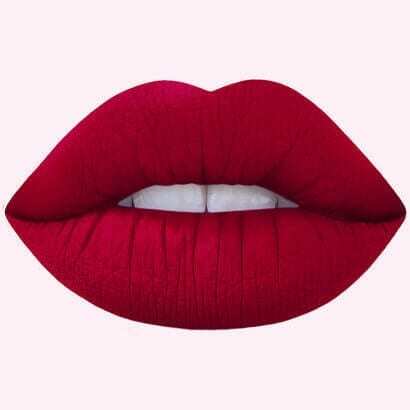 And her child, Lime Crime, has grown into something she can truly be proud of. 8 benefits of bone broth for health and beauty	What are the benefits of MCT oil?